With Palm-Tech, it's easy to create your own customized home inspection forms that fit you and your inspection style. 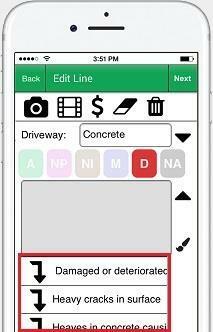 Change the categories to match the order you inspect and edit the language so that it's yours. Having a form that is catered to you and the way you inspect will save you time on-site. Palm-Tech is a drop-down driven program that allows you to easily select the information you want to enter into your inspection by selecting it from a dropdown. Don't retype the same information over and over again. Type it once, save it to your drop-down, and use that same narrative on all of your future inspections. Here on the Palm-Tech website, we provide you with an abundance of video tutorials and How To guides that will help you learn the software quickly. You can also check out one of our pre-recorded webinars to be up and running with Palm-Tech in no time.